Yet another successful space unconference ! The second French edition of a SpaceUp, the unconference focused on space, was successfully held on September 20th & 21st, 2014, at Cité de l’espace in Toulouse. 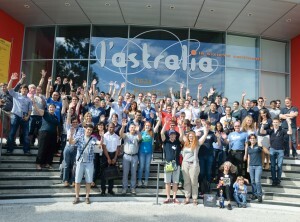 The participants were awed by the beautiful settings of Cité de l’espace, and they also greatly appreciated the guided tour of the Extreme Explorations exhibition, the « Back to the Moon, for Good » iMax movie, the exceptional quality of the lunches at the Astronaut Café, and the group picture taken with the Ariane 5 replica in the background. A guided tour of the Airbus Defence and Space satellites assembly and tests facilities in Toulouse was organised at the end of the afternoon on September 19th for a group of about 20 participants. 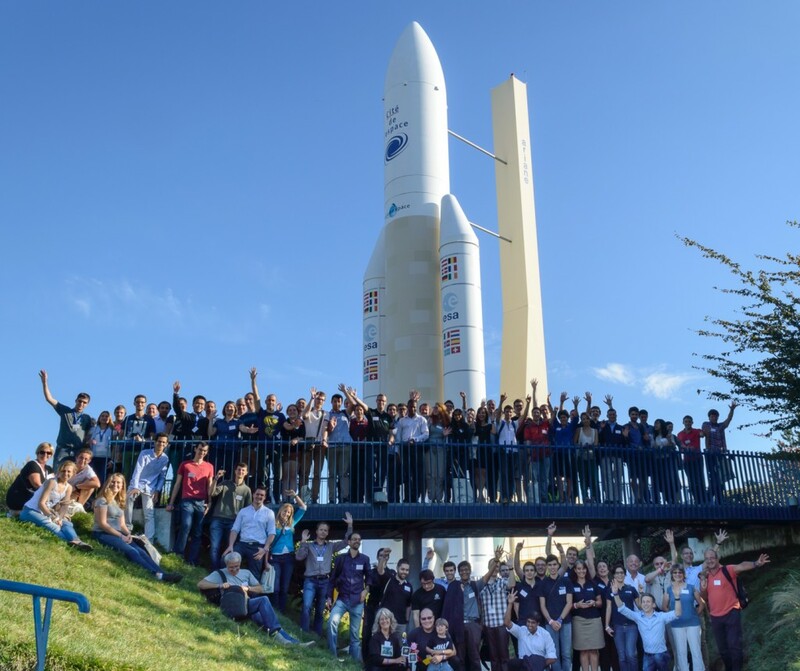 115 people passionate about space, a quarter of whom were women, attended SpaceUp Toulouse. They were of 17 different nationalities (5 different continents), and about 75% were French. In keeping with the unconference concept, a vast majority of the sessions were hosted by the participants themselves, who gave high-quality and highly specialized talks, in English, for instance about the weather on exoplanets, the Airbus space plane, model rocketry, space and astronomy tourism, Earth observation via satellites, or the Eurocom job (the European “Capcom”, in contact with the astronauts aboard the Space station). Mingled with the participants were scientific experts, such as Philippe Gaudon, Rosetta’s project manager for CNES, the French space agency, who introduced the stakes and challenges of the mission. On the astronomy side, Mathieu Isidro presented the SKA (Square Kilometer Array), which will begin construction in 2018, and will be the world’s largest array of radio telescopes. Human spaceflight was also discussed. ESA’s Hervé Stevenin, who –among other responsibilities– leads the extra-vehicular activities (EVAs) astronaut training, recounted via a video link the NASA NEEMO19 underwater mission to which he had just participated. Two ESA astronauts also took part via a video link. The first of them was Léopold Eyharts, who has been to space twice, and who delivered the Columbus European laboratory to the Space station and activated it. The second astronaut to speak in was Thomas Pesquet, who is currently training for his 2017 long-duration mission aboard the International Space Station. SpaceUp Toulouse 2014 was supported by Cité de l’espace, Airbus Defence and Space, ESA (European Space Agency), CNES (Centre National d’Études Spatiales), the Community of Ariane Cities (CVA), Spacecareers, the Square Kilometer Array (SKA), the 3AF (Association aéronautique et astronautique de France), the European Southern Observatory (ESO), the Fondation Arts et Métiers and the International Space University (ISU). The SpaceUp France non-profit organisation has been active from the start on social networks (Facebook, Google+, YouTube), and especially Twitter. On the day after the event, more than 2300 tweets had been sent by more than 400 contributors. The reach, i.e. the number of accounts who received a tweet, is estimated at over a million. Those tweets were displayed more than 4,2 million times. Of course, these figures only account for the twitter activity during the weekend, not the global impact of the event. This visibility makes SpaceUp Toulouse an outstanding success of which the team is proud of. Articles and posts have been published about the SpaceUp, including by EnjoySpace and Mathieu Isidro from SKA. SpaceUp also received some air time –before and after– on the France Bleu Toulouse radio station. The SpaceUp Toulouse replay will soon be available here. More than 400 pictures were posted to the Flickr group; if you have not added yours, please do so! If you gave a formal presentation during SpaceUp Toulouse and would like to see it featured here, please post it online (on SlideShare or Scribd, for instance) and send us the link! Please use this email address to send us the link to your hosted presentation. Two years ago, the SpaceUp Paris team setup a non-profit organization, SpaceUp France, to organize SpaceUp unconferences in France. The board members change every year, but the spirit stays the same. (As a bonus: web site, bank account, and a wealth of experience are also transmitted from one team to another!). 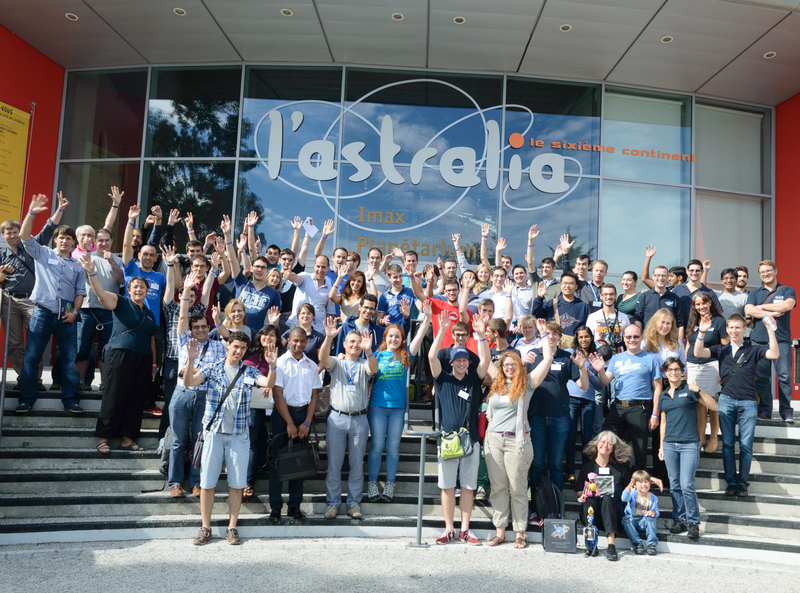 If you want to host, organize, or just help with the next french SpaceUp, please let us know! For 2015, the next SpaceUp organized by SpaceUp France will be SpaceUpX at Palaiseau, near Paris, on the campus of the prestigious École Polytechnique.